The supreme court decision to be announced today has a greater historical implication than the presidential election, by one hundred fold. Elections are always promises made and promises broken with few exceptions. But today is one of those bright lines where we will see if there will be any freedom in this new Scientistic Dictatorship. People have focused on the "individual mandate" as if it is the only objectionable part of Obama Care. Few have grasped the hellish reality of health decisions being (1) mandated (2) regulated and (3) rationed by a Scientistic Dictatorship, over which we have NO control. Watching the anger toward the law, turn to grinding complacency has been hard to watch, and personally disheartening as more and more people have been taken-in by "parts" that is benefits of the bill. Showing that they would be willing to completely and totally trash their humanity and agree to be "beast only" for some personal benefit. Ultimately that is the implication of this law, since the Scientistic Establishment sees you as "beast only" and holds no recognition of your humanity. It plans for you, like planning for livestock or crops, in the same Scientistic Paradigm, without any recognition of the Human having any higher purpose than the dung beetle. If you doubt this assertion I would challenge you to take Dr Wyman's course at Yale University about the "difficulties" of Human Population. Linked here. At this point in time, it is glaringly obvious that increasing numbers of people are willing to trash the bill of rights, the last vestige of the recognition of U.S. Citizens as "Humans" endowed by their Creator with unalienable rights, for the feeling of security, convenience or ease that cattle must surely feel inside the protection of the stockyard. That is the carrot the progressives have used to increase their authority administration after administration, Democrat AND Republican. The choice of candidates for this election mark out this TRUTH boldly. At present the only semblance of freedom we have left is that we are not forced to pay tax because we breath. That is what the "mandate" should have rightly been called from day one, the Breath Tax. 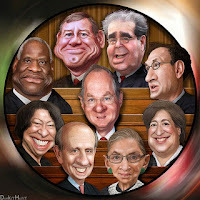 IF the supreme court affirms "The Breath Tax" then we have not just lost our rights, our genuine enslavement to the Scientistic Dictatorship has begun. What most people don't realize is that it isn't merely the enslavement of "humans" but the denial of the human as human. Since surrender of our very bodies to the Dictatorship of a State Scientistic system, to care for it, to govern every aspect of its "life cycle," is agreeing to be marked as beast only - that is - it is Accepting the Mark of The Beast. Lets you believe this to be an exaggeration look up the "Whole Life Chart System," read about what it means, how the person is arbitrarily "valued" ONLY according to age and relative health of the body; how the vulnerable young and old and the defective are sacrificed, not with the dignity of humans, but with the certainty of culling the herd. I will never accept the Mark of The Beast.